I am here in New Orleans, and ALA is raging all around me. My publisher had a bunch of ARCs for PAST PERFECT at the booth this morning, but now they are ALL GONE. This is a good thing if you are, say, me, because that means that many people are now going to read my new novel. It’s also a good thing if you are my publisher, because that means they don’t have to ship home boxes of unclaimed PAST PERFECT ARCs. However, this may not be such a good thing if you are a librarian or other publishing professional who didn’t manage to snag one of the copies being given away today. Here is a Galley Grab link for an electronic version of the PAST PERFECT galley. There are some restrictions here– like you can’t email the file to a friend, and you can’t read it on certain e-readers– but otherwise it’s just like an ARC. Only on a computer! If you are a publishing professional (bookseller, librarian, book blogger, etc. ), you can click on that link, register for the Galley Grab program, and read PAST PERFECT. Here is the link again, if you want to copy and paste: http://www.galleygrab.com/?asset_url=9781442432055. And now I am going to sleep. Because it is 11:45pm in New Orleans, and clearly I know how to party. I am leaving for New Orleans on Thursday! I am v. excited, one because it is ALA so I will get to meet many readers and participate in exciting events, and two because of BEIGNETS. 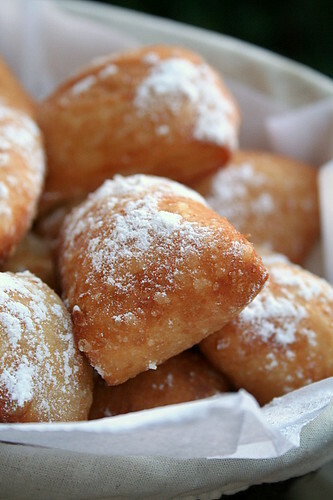 My only previous experience with beignets was at ALA two or three years ago, in Anaheim, where I ate beignets at the New Orleans-themed restaurant in Downtown Disneyland. Were they delicious? Um, I don’t know, I guess it depends on how you feel about FRIED STUFF AND POWDERED SUGAR. –YALSA’s YA Authors Coffee Klatch, on Sunday morning. This is basically YA author speed-dating– there are going to be more than 25 of us there, including Sarah Dessen, Jay Asher, Lauren Myracle, Cassandra Clare, me, etc. So you won’t get bored, plus there is free coffee. So, yeah. That is my ALA plan. Also I might take a riverboat. What about you? Will I see you there?